In 1954 a company that would later become British Petroleum, commissioned a young Jacques Cousteau to undertake an oceanographic survey of the Arabian Gulf on his now famous ship, the Calypso. This was made possible in part due to Cousteau's co-development of the Aqua Lung underwater breathing apparatus. This device allowed people to go underwater for longer, and eventually allowed them to do good, and bad things to the world. As Cousteau's career progressed, he became a vocal conservationist. However, as a factor in the discovery of oil, the survey of 1954 was instrumental in irreversible changes in both the region and the world. In 2018, Whelan travelled to a series of coordinates from Cousteau's survey. With a dive team he conducted his own visual surveys of the sea bed. During these surveys, non-invasive sand samples were collected. Working with a master glass blower, he transformed the samples from the dive sites into a series of glass batches that were then blown into used diving cylinders, creating a sense of agency through transformation. 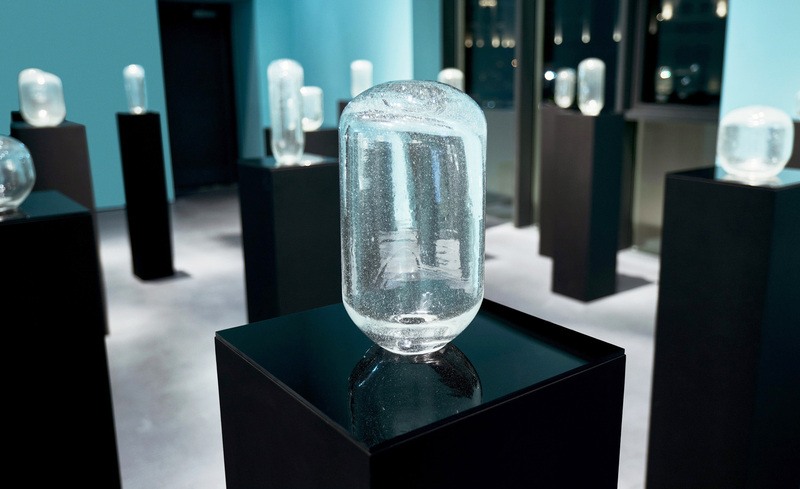 The form is hollow, made from human breath, which combined with the air bubbles in the glass evoke a sense of the fragility of life, both human and nature.